Here you’ll find a list of our most frequently asked questions. These FAQs are designed to provide a better understanding of the scope of services Coventry Grinders offer. For more information or support, or for any other enquiries, please get in touch via our contact page. How do you harden Gauge Plate? Is Gauge Plate the same as Ground Flat Stock? Yes they are both the same product made of 01 tool steel. Gauge Plate is the historical name for the product in the UK it stems from when engineers would refer to sizes as gauge. I need a bespoke size is this possible? Yes, here at Coventry Grinders we can make almost any non standard size, we also offer cut pieces so if your only looking for a 1 off small piece please email your enquiry and we will send you a quotation. How flat is Ground Flat Stock / Gauge Plate? Unfortunately there is no real definitive flatness tolerance. The “flat” in ground flat stock purely means its not round. Flatness depends on thickness, 1mm thick material is difficult to make as it is so thin thus more susceptible to bowing. Thicker sizes tend to be more stable. An acceptable tolerance would be 1mm in 1000mm long. If you require a specific flatness tolerance email or call us to discuss this possibility. Gauge Plate is supplied in an annealed condition to a maximum of 229HB – 21 Rockwell C. Annealing is a process in which the steel is heated to a specific temperature and allowed to cool slowly. This then softens the material allowing it to be cut and machined easier. Is Gauge Plate / Ground Flat Stock square? Unfortunately Gauge plate is manufactured in bulk from bar and cropped raw material pieces. Care is taken to achieve the best squareness possible but to ensure a tolerance could be achieved each peice would have to be ground & inspected on its own merits. This would be very time consuming and thus cost considerably more to produce. Here at Coventry Grinders we are able to check the squareness of stock pieces if requested before ordering. We can also produce to a bespoke drawing requirement. Please contact us for this service. 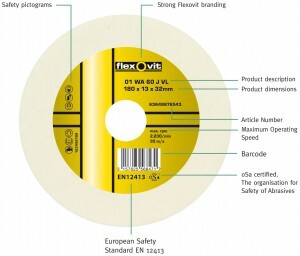 Labels can sometimes be confusing in understanding what type and grade of wheel you have. There can be batch numbers, speeds and product codes but there will always be the wheel specification on there. Each manufacturer have their own grades and with this information we can help you choose the right wheel for you. Please see this guide on how to identify. The easiest way to understand this is the lower the number the coarser the grit of abrasive grain. A 24 grit size is very coarse and a 320 grit is fine. Each have their own uses, coarse for stock removal, fine grit for a good finish on the workpiece. What should I use to grind stainless steel? In precision grinding environment you will require a green silicon grinding wheel. Coventy Grinders offer a range of green silicon wheels for sale so please contact us for more information. In fabrication industry you will require a grinding or cutting disc that is suitable for inox this will be on the label of the wheel. For applications using a flap disc these require a zirconia or ceramic grit content. What should I use to grind hardened tool steels? For precision grinding of hardened tool steels such as 01 & D2 you should use a ceramic grain wheel. These are normally sky blue in colour. There are degrees of ceramic wheel ranging from 10 -50%. Most common used are of a 30% content. ceramic grain fractures under the pressure of grinding, by doing so the grain reveals more sharp points to enable grinding. Conventional white grinding wheels that are made from aluminium oxide grain blunt rather than fracture meaing you have to dress the wheel more. We recommend you dress the wheel with a clustter diamond for rough grinding / stock removal as this opens up the wheel more giving more sharper points to cut with. To achieve a good surface finish dress the wheel slowly with either the cluster diamond or a single point diamond. Where does Silver Steel get its name? Unfortunately silver steel does not contain silver! Due to a high chrome content once ground gives the material a nice shiny finish. similar to silver. Can Silver Steel be hardened? Is our Silver Steel made to BS1407 specification? Yes it is and this British standard ensures that the product is made to a close tolerance. Other European specifications have a bigger tolerance so if you need to guarantee a close tolerance then our Silver Steel is for you. Do we make bespoke sizes? Yes we do, it would be subject to a minimum quantity of your required diameter. Please email or call us with your enquiry. What type of steel is Key Steel made from? Our key Steel is made from EN8 material supplied in a bright drawn condition. What is the tolerance of Key Steel?